North Korea's state media is busy publicizing leader Kim Jong-un's diplomatic acumen. The state media slapped on lavish photo spreads of Kim standing next to Chinese President Xi Jinping and U.S. Secretary of State Mike Pompeo this week, when it suddenly seemed that North Korea’s leadership has burst out of decades of diplomatic isolation. 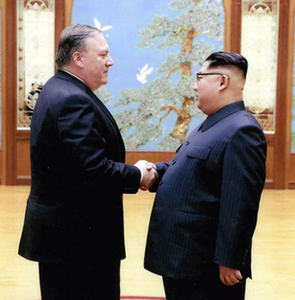 The Rodong Sinmun on Thursday published a front-page report on the meeting between Kim and Pompeo with eight photos. State media said Kim and Pompeo reached a "satisfactory agreement" and even reported that Kim voiced gratitude to U.S. President Donald Trump. North Korean leader Kim Jong-un (center) waves as U.S. Secretary of State Mike Pompeo leaves Pyongyang on Wednesday, in this screen grab from [North] Korean Central Television. Wednesday's edition of the Rodong Sinmun allocated the first four of its six pages to coverage of Kim's summit with Xi in Dalian, China. The propaganda machine seems intent on presenting an image of the North developing into a negotiating or even a cooperating partner of the U.S. and China. Kim's April 27 summit with President Moon Jae-in was also given wide coverage. The task is to appease public sentiment, especially among the elite, amid crippling economic sanctions that are starting to hit even the privileged. State media also have the unenviable task of explaining why all the country's resources have been squandered on its nuclear and missile programs for years, only for Kim to offer to give them up. State TV showed footage of Kim's younger sister Yo-jong bowing to Xi during a banquet while holding his hand. She can also be seen raising a wine glass to Xi and leaning forward in a show of deference while conversing with the Chinese leader. 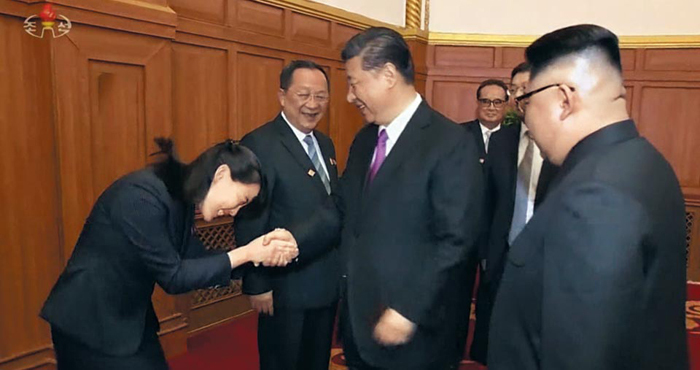 North Korean leader Kim Jong-un's sister Yo-jong (left) bows to Chinese President Xi Jinping on Tuesday during her visit to Dalian, China, in this screen grab from [North] Korean Central Television. The image contrasted starkly with Kim Yo-jong's body language when she met President Moon Jae-in during the Winter Olympics, when she stood uncomfortably bolt upright. But the Rodong Sinmun on Thursday still found room to denounce the U.S. in reference to the 1950-53 Korean War. "The people are once again becoming clearly aware of the cruelty of the U.S. imperialist invaders and their hearts burn with animosity toward them," it said.